Lexington, Ky. – Bruce “Buck” Davidson Jr. and Sydney Hagaman held on to their first place positions, following the show jumping phase, to secure the USEF One-Star Eventing National Championships as part of the Hagyard Midsouth Three-Day Event & Team Challenge. Davidson led the victory gallop with Legion Kat as they claimed the USEF One-Star Eventing National Championship for the Richard Collins Trophy on an overall score of 41.50. Hagaman and Diablo Tejano secured the USEF One-Star Eventing Junior and Young Rider National Championship for the Harry T. Peters Trophy with an overall score of 50.30. Davidson (Ocala, Fla.) nabbed his second CCI1* win this year with Natalie Sandler’s Legion Kat. The 2006 Thoroughbred gelding looked brilliant during Thursday’s dressage test as he gave a graceful performance, proving his reliability, for a score of 37.5. They cruised through Friday’s cross-country course without penalties to remain on their dressage score. During show jumping today, they had a rail down at fence seven, which tacked four penalties on to their score. 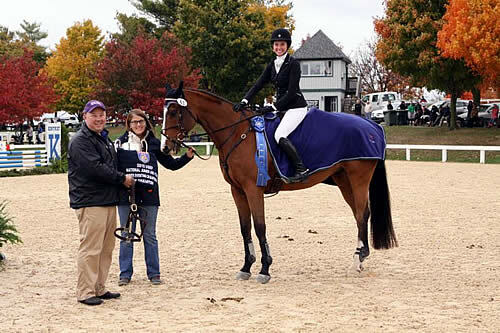 With a score of 44.30, Davidson and the 2008 Thoroughbred gelding Summer Sleigh Ride were named the Reserve Champions in the USEF One-Star Eventing National Championship. Although very green at the CCI1* level, Andrea Davidson’s Summer Sleigh Ride gave an excellent dressage performance for a 40.3. They breezed through the cross-country course to remain on their dressage score. However, they knocked a rail down in show jumping which added four penalties to their overall score. “It’s always fun coming to the [Kentucky] Horse Park no matter what. They had a nice [cross-country] course yesterday. I’m really happy for Legion Kat and Summer Sleigh Ride; they were both really good. It was a good weekend for all the babies, and now we get to move forward. They’ll go to Florida and get a little rest, probably take a month off, then hopefully come back stronger and better and ready to go next year,” said Davidson. Coming from behind to take third place was Danielle Dichting Busbee (Roswell, Ga.) and First Lyte, Meadowview Farm’s 2006 Thoroughbred mare, with a score of 45.2. Their double-clear show jumping round gave them the edge. Davidson and Escariz Du Rona, Andrea’s 2009 KWPN mare, struggled in show jumping as they had two rails down for eight penalties. This set them back to 10th place with a total score of 50.1. Busbee and First Lyte had a solid dressage test for a score of 45.2 and followed it with an error free run through the cross-country course. If it were not for an outstanding dressage score, Hagaman (Danville, Ky.) and her own Diablo Tejano could have easily missed out on their first CCI1* title. The 2003 Thoroughbred gelding exhibited very fluid gaits and lovely trot work in their dressage test for a score of 38.3. They made it through the cross-country course easily, without penalties, to remain on their dressage score. However, they struggled in show jumping, knocking down three rails, giving an overall score of 50.3. “This is so surreal; this is our first win in five years. We’ve had some show jumping issues over the years. Yeah, we took down three rails, but he was listening and jumping the best he ever jumped before. I think he was ready to come out and win it. He was great the entire weekend,” said Hagaman. Caroline Martin (Gwynedd Valley, Pa.) was the Reserve Champion in the USEF One-Star Eventing Junior and Young Rider National Championship. The Davidson protégé had the title in her reach; however, show jumping got the best of her and her own Danger Mouse. The combination had two rails down for an overall score of 52.7. She and the 2008 Warmblood gelding performed a good dressage test, full of lovely trot and lateral movements, for a score of 44.7. They tackled the cross-country course delicately, running at a slower pace than much of the field. That decision paid off as they still came under time without any penalties. 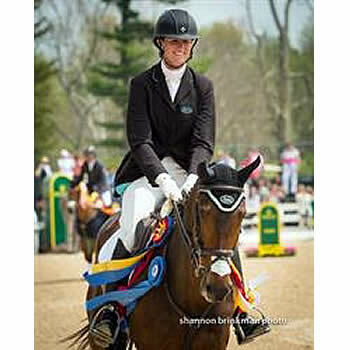 Because of a double-clear show jumping round, Erica Jarrel (Lincoln, Mass.) and her own Uni Sprite, a 2005 Welsh Sport Horse gelding, moved back into third place after riding at a slower pace on the cross-country course. They began the competition with a dressage score of 49.7 and added 3.60 in time penalties during cross-country for a total score of 53.3. They were one of two combinations in the Junior and Young Rider division who went double-clear in show jumping. Fort Worth, Texas (January 7, 2015) — Neue Schule Ambassador Buck Davidson has achieved an outstanding year of victories in 2014, and as the year drew to a close he earned recognition prestigious enough to match his eventing talents. At the 2014 United States Eventing Association (USEA) Convention in Fort Worth, Texas, Davidson was named the USEA High Score Rider of the Year. Davidson’s mount Ballynoe Castle RM was named the USEA Highest-Scoring Horse of all time — breaking the record held for the past eight years by three-time Rolex Kentucky winner Winsome Adante. Davidson, the son of back-to-back world champion eventer Bruce Davidson, has led an impressive riding career in his own right. Just in 2014, he was named the 2014 Adequan USEA Gold Cup Champion and finished third on Ballynoe Castle RM at the Rolex Kentucky 4*. The pair also made their second World Championship appearance as members of the Land Rover U.S. Eventing Team at the Alltech FEI World Equestrian Games. In 2013, the impressive duo received the Pinnacle Trophy for Highest Placed U.S. Rider at the Rolex Kentucky CCI****. Davidson says that fourteen-year-old Ballynoe Castle RM, an Irish Sport Horse gelding affectionately known as Reggie, is “without a doubt” his favorite mount. “Horses don’t do what he’s done. He gives the best effort every single time you ride him. 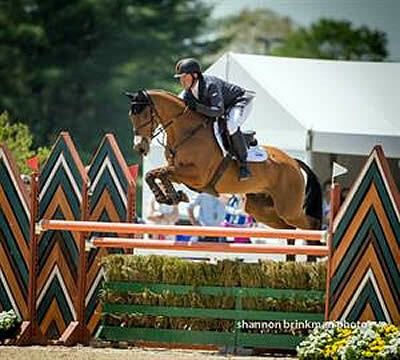 He’s the smartest horse I’ve ever been around,” the champion eventer states. Neue Schule offers an innovative range of high-performance bits constructed to increase comfort and rider-horse connection. The bits are ergonomically designed using the latest engineering and computer aided design (CAD) technologies. They incorporate a unique patented metal alloy called Salox Gold®, which is the most thermally conductive bit-making material on the market. This enables Neue Schule bits to reach the temperature of the horse’s mouth more rapidly, while the metal’s decreased bioactivity remains tasteless to the horse — resulting in a more relaxed acceptance of the bit. Through soft, consistent contact with the horse’s mouth, the Neue Schule design increases responsiveness to the rider and alleviates problematic issues that can occur between the horse and the contact with the bit. With a Neue Schule bit joining them, horses like Ballynoe Castle RM and riders like Buck Davidson can rise to the height of performance in their sport. Tyler, TX (October 1, 2014) – Equipped with his favorite tack from World Equestrian Brands, Buck Davidson flew over jumps and glided across the dressage arena at the Nutrena USEA American Eventing Championships in Tyler, Texas. His outstanding performances throughout the intensive competition resulted in the title of 2014 Adequan USEA Gold Cup Champion. World Equestrian Brands, the popular tack distributer that has sponsored Davidson for over 10 years, congratulates him on his latest success. Davidson jumped double clear over the daunting course in the $40,000 2014 Adequan Advanced USEA Gold Cup Final division of the Nutrena USEA American Eventing Championships, presented by VTO Saddlery, on Saturday, September 27. His score of 39.6 earned him first place in the championship’s most prestigious division, which the humble eventing champion credited to his mount Petite Flower (owned by Caroline Martin). “Flower did what she always does and gave me her 110% in show jumping, and I just tried to stay out of her way,” Davidson commented. Davidson’s skill in coaching riders was as apparent as his riding abilities during the Gold Cup Final division — his student Laine Ashker came in second place, scoring better than every other rider except for Davidson himself. With several wins already under his belt this year, Davidson also gave a stellar performance on the opening day of the competition, September 25. He and Quasar, an Oldenburg owned by Ann Clements, seemed to move on air through their dressage phase of the Merial Open Intermediate division. The pair’s score of 30.4 helped bring them to second place in the division. Virginia-based tack distributer World Equestrian Brands was cheering Davidson on throughout the weekend, and is thrilled with his final results. “Buck is a longtime supporter of World Equestrian Brands products, and he rides all his horses in our Amerigo, Vespucci, Mattes, and Equilibrium Products,” said Robin Moore, CEO of World Equestrian Brands. To learn more about World Equestrian Brands and its top-quality tack manufactures, visit www.worldequestrianbrands.com or call 1-888-637-8463. Tyler, Texas – Clear rounds were the order of the day at the Texas Rose Horse Park over Richard Jeffrey’s testing show jumping track at the 2014 USEF National Open Horse Trial Championship held as part of the Nutrena USEA American Eventing Championships presented by VTO Saddlery. 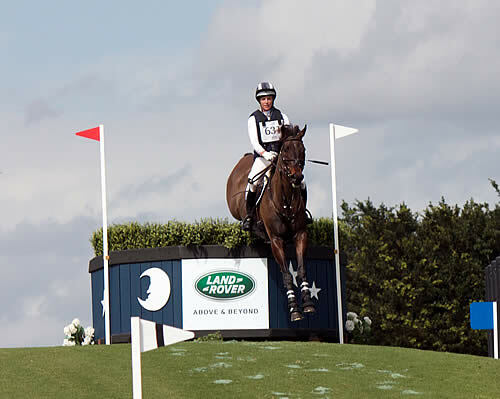 Land Rover U.S. Eventing Team veteran Buck Davidson proved why he is regarded as one of the best in the game guiding Petite Flower to the only fault-free trip of the division to earn the 2014 National Title and have his named added to the Jack Le Goff Trophy. Davidson (Ocala, Fla.) and Sherrie and Caroline Martin’s 12-year-old Thoroughbred mare stood fourth after the dressage on a score of 34 and maintained that position heading into the show jumping as a result of jumping clear on the cross country adding only 5.6 time faults. With their immaculate performance on Saturday afternoon the 2013 Galway Downs International Three-Day Event winners finished on an overall total of 39.6 to earn victory by one point. Earning Reserve Champion honors were Lainey Ashker (Richmond, Va.) and her own 15-year-old Thoroughbred gelding Anthony Patch. The 2013 champions were the final pair of the afternoon to jump, looking to retain their title but it was not meant to be as a single rail came down meaning they finished on a score of 40.6. Mathew Brown (Sebastopol, Calif.) and Blossom Creek Foundation’s eight-year-old Irish Sport Horse gelding, Super Socks BCF, earned third-place honors as they too had a single rail down to finish on a score of 41.3. To learn more about the Nutrena USEA American Eventing Championships presented by VTO Saddlery, visit: http://useventing.com/aec. Lexington, Ky. – The 2014 Rolex Kentucky Three-Day Event presented by Land Rover came to a close Sunday afternoon with 37 horse-and-rider combinations entering the final phase of competition. Richard Jeffery’s 13 obstacle show jumping course set the stage in the Rolex Stadium for an exciting finish to Kentucky’s CCI4*. A sold-out crowd of 22,388 saw 10 pairs went double clear with five of those being the top five riders. William Fox-Pitt (GBR) held onto his lead with Bay My Hero to claim the 2014 Rolex Kentucky Three-Day Event presented by Land Rover win, adding nothing to his dressage score of 44.0. With Catherine Witt’s 11-year-old Irish Sport Horse gelding, Fox-Pitt finished with his usual winning style, jumping double clear to claim his third win in Kentucky. Bay My Hero has been in Fox-Pitt’s yard since he was five, so he has long been part of his team and feels like a family member, making the win all the more meaningful. Their long relationship with one another paid off on Sunday at the Kentucky Horse Park. Lauren Kieffer (Middleburg, Va.) and Veronica rose to the occasion and handled the pressure to finish in second place on their dressage score of 46.7. 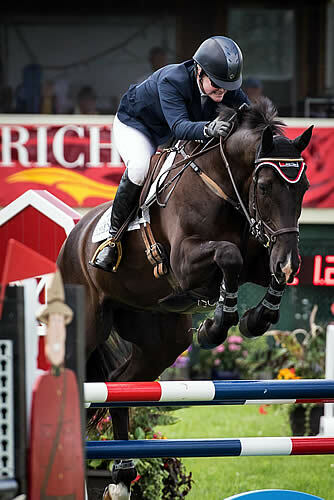 She and Team Rebecca, LLC’s 12-year-old Dutch Warmblood mare looked like a veteran pair in Sunday’s jumping phase, putting the pressure on Fox-Pitt and Bay My Hero with a double clear round. While it seemed possible that an American might win the country’s CCI4*, it wasn’t mean to be. However, Kieffer has risen to the top of the sport in the U.S., earning the Rolex/USEF National CCI4* Championship title for her efforts. Though Kieffer has only had the ride on Veronica for about a year, taking the majority of that time to develop their partnership, she has known the mare since she was imported as a young horse and rode her briefly at that time. With the barn name of “Troll” for her lack of appreciation for affection, Kieffer noted that her fighting spirit comes in handy when it counts. The pair that won last year’s Rolex/USEF National CCI4* Championship title, Buck Davidson (Ocala, Fla.) and Ballynoe Castle RM, maintained their top form from a year ago and earned a third-place finish. Having a solid double clear round, Davison and Cassandra Segal’s 14-year-old Irish Thoroughbred gelding ended up on their dressage score of 51.7. The pair became the 2014 Rolex/USEF National CCI4* Reserve Champions for their strong finish. “Reggie has been a consistent horse his whole career. I really didn’t change anything,” Davidson said of having another top finish in Kentucky with longtime partner Ballynoe Castle RM. Davidson had to deal with a bone bruise that Ballynoe Castle RM had last year, after the horse had no previous injury throughout his career. He gave “Reggie” the fall season off and after starting him back successfully early this year, the horse developed pneumonia but made a full recovery. An exciting addition to the competition this year was the Dubarry of Ireland Nations Team Challenge, which awarded $20,000 in prize money while helping national teams prepare for the team competition at the 2014 Alltech FEI World Equestrian Games. For their impressive performances, Team USA won with a total score 150.1. The scores of Kieffer and Veronica (46.7), Davidson and Ballynoe Castle RM (51.7), and fourth-place finishers Sinead Halpin (Oldwick, N.J.) and Manoir de Carneville, Manoir de Carneville Syndicate LLC’s 14-year-old Selle Francais gelding (51.7), were combined to give the home country the victory. Second place went to Great Britain with a score of 163.8, while third place went to Canada with a score of 209.9. Catch all the excitement with on-demand video on the USEF Network presented by SmartPak here: http://www.usefnetwork.com/featured/2014Rolex/. Temecula, Calif. – Competition for the CCI3* began Friday at the Galway Downs International Event and Horse Trials with the field of 17 performing their dressage tests. Buck Davidson holds the top two places on the leaderboard with The Apprentice and Absolute Liberty with scores of 48.9 and 50.6, respectively. Davidson (Ocala, Fla.) received a USEF Land Rover Competition Grant to bring Sharon Will’s Absolute Liberty to the West Coast for her first CCI3* since 2011. He and the 10-year-old Oldenburg mare performed a lovely, relaxed test to sit in second place. “She’s had 18 months off and hasn’t done much to get here. I know there’s way more in there and I’m really excited about that,” explained Davidson. “I’m just really happy to have her back. The pair brought home Team Gold and Individual Bronze medals from the 2011 Pan American Games. They had a good prep run for the Galway Downs CCI3* at the Plantation Field Horse Trials, where they finished fifth in the Advanced A division. Allison Springer (Upperville, Va.) was also awarded a USEF Land Rover Competition Grant to travel across the country with Copycat Chloe. The 11-year-old Trakehner/Thoroughbred mare owned by Copycat Chloe Syndicate has struggled with tension during the dressage phase in the past but Springer rode a flowing, accurate test to receive a score of 55.0. The pair heads into Saturday’s cross country phase in sixth place. Cross country for the CCI3* at 1:45pm PT. Davidson and Absolute Liberty will leave the start box at 2:18pm PT, followed by Springer and Copycat Chloe shortly after at 2:30pm PT.